Bride and Groom Wedding Trees, ideal to decorate a wedding with a difference! 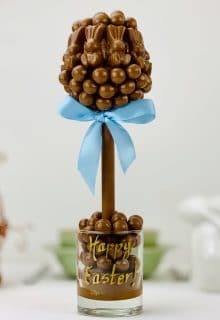 Edible wedding centrepieces, for weddings with a difference. Fully edible the Bride tree is made from Marshmallows and the Groom tree is made from Ferrero Rocher®. They are decorated with the option of Bride on the base, and/or Groom, or a name if you would rather. These trees are decorated with a top hat and a veil to suit the occasion. The veil/top hat are not attached to the tree, and therefore have to be placed on top of the tree when in position. Marshmallow (Van Damme): Glucose-Fructose Syrup (Wheat), Sugar, Water, Dextrose (Wheat), Pork Gelatine, Flavouring (Vanilla), Colours (E120). Rice Krispies contain rice, sugar, salt, malt flavoring, iron, ascorbic acid (vitamin C), alphatocopherol acetate (vitamin E), niacinamide, vitamin A palmitate, pyridoxine hydrochloride (vitamin B6), riboflavin (vitamin B2), thiamin hydrochloride (vitamin B1), folic acid, vitamin B12 (as cyanocobalamin), and vitamin D brown wheat flour (sugar, malt extract, vegetable oil, wholemeal, raising agents (sodium bicarbonate, tartaric acid and malic acid) and salt. Partially inverted refiners syrup. Raisins.